Dan Truckey, director of the Beaumier U.P. 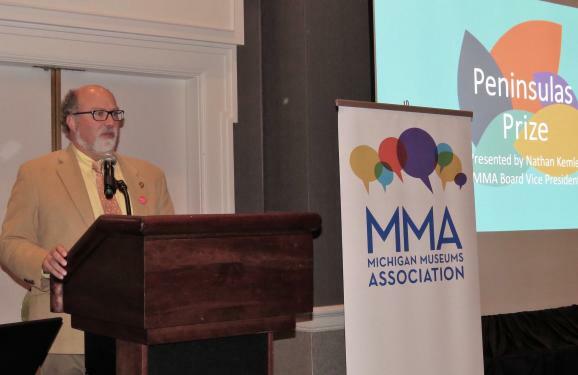 Heritage Center at NMU, was awarded the Peninsulas Prize by the Michigan Museums Association at its annual meeting Oct. 29 in Dearborn. The statewide prize honors an individual or organization that has demonstrated the significance and impact of community engagement over the last year. “Dan has been a quiet leader for the field in the state for the past 16 years, the past 12 years at the Beaumier U.P. Heritage Center at Northern Michigan University," said Nathan Kemler, MMA Board vice president, in a press release. "Under Dan's leadership, the Beaumier U.P. Heritage Center has compiled an astonishing record of community engagement and educational outreach in the Upper Peninsula, Specifically, 20 major exhibitions related to the history and culture of the Upper Peninsula, seven of which have toured the Upper Peninsula; an average of 25 public programming events each calendar year since 2009, including concerts, symposiums, lectures, workshops, films, food events, bus tours and private tours; a two-time recipient of grant funds from Arts Midwest to host residencies of traditional folk music groups in Marquette County,programs that impacted nearly 10,000 schoolchildren and hundreds of community members. The Beaumier Center also created the Upper Peninsula Heritage Awards in 2009, which has recognized 12 tradition bearers and preservationists in the region." Truckey is a long time member of MMA and served on the board of directors from 2007-2011, according to the release.